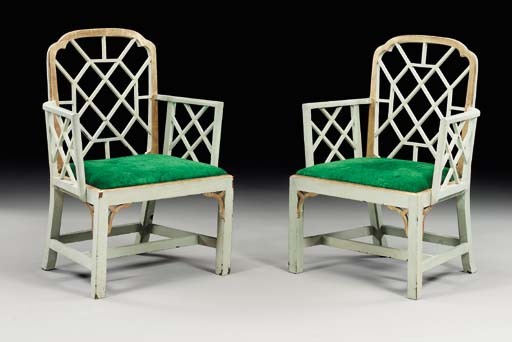 These chairs are notable examples of a highly fashionable pattern in the George II 'Chinese' manner. Their fretted-trellis backs derive from the type of patterns published in W. Halfpenny Twenty New Designs of Chinese Lattice (1750). The octagonal form of the central tablet is featured on a Chinese chair pattern in Chippendale's Director, 1754, pl. XXVII. In addition, these chairs are closely related to the well-known set of chairs commissioned by the 4th Duke of Beaufort for Badminton House, Gloucester and still at the house (see P.Macquoid, The Age of Mahogany, 1906, p.258, pl.245).